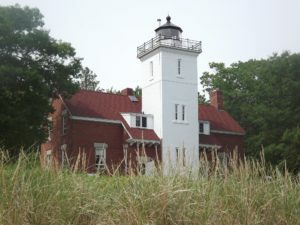 Unlike many Great Lakes lighthouses, Forty Mile Point Light does not mark a significant port, but was built so ships would never be out of viewing range of a lighthouse. The light is 40 miles sailing distance from Mackinaw Point, or just north of Rogers City. the Joseph S. Fay, one of 27 wooden ships that sank during a fierce storm in 1905. You can see about 150′ of her side wall resting on the beach near the lighthouse. Other features include the steamer Calcite pilot house, a picnic area, swimming beach and hiking trails.